1>Done building project "foobar2000_ATL_helpers.vcxproj" -- FAILED. 6>Done building project "foo_sample.vcxproj" -- FAILED. The same problem has been reported by another user who apparently solved it by following these crystal clear instructions. I did the same, but nothing changed: i get the exact same warnings and failed to build the project. I'm new to C++ and visual studio, but everytime I resolve to get into it, I'm discouraged by the gap between tutorials and reality. Any help to move on would be much appreciated. 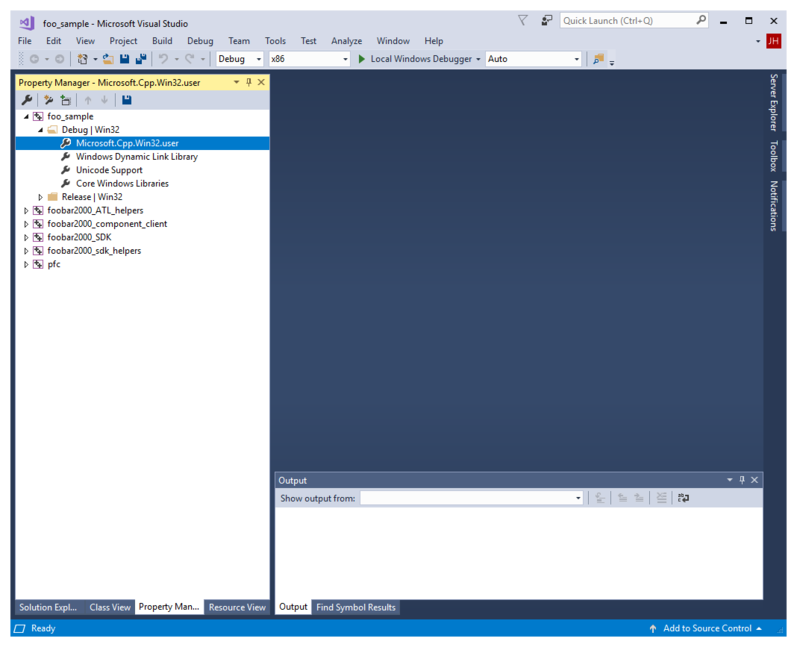 Once you have downloaded and extracted WTL somewhere I recommend adding the WTL include directory to Visual Studio's include directory listing permanently. You can do in properties dialog of Microsoft.Cpp.Win32.user you can open in Property Manager. Try to clear the solution, then rebuild. Then you did definitely something wrong. What is the path where you extracted the WTL archive and what is the setting for the include directories? It would be the best, if you would post screen shots with the relevant information here. Thanks, I'm going to try this immediately. Well, all I can think of is: maybe you changed "Include Directories" settings for Release configuration, but then you tried to build Debug configuration. 6>foo_sample.rc(10): fatal error RC1015: cannot open include file 'afxres.h'. I can't find an afxres.h file in neither of the SDK or WTL folders. So you didn't add the WTL include directory in the Property Manager. It would have affected both debug and release builds not only for this sample project but for all future projects too. 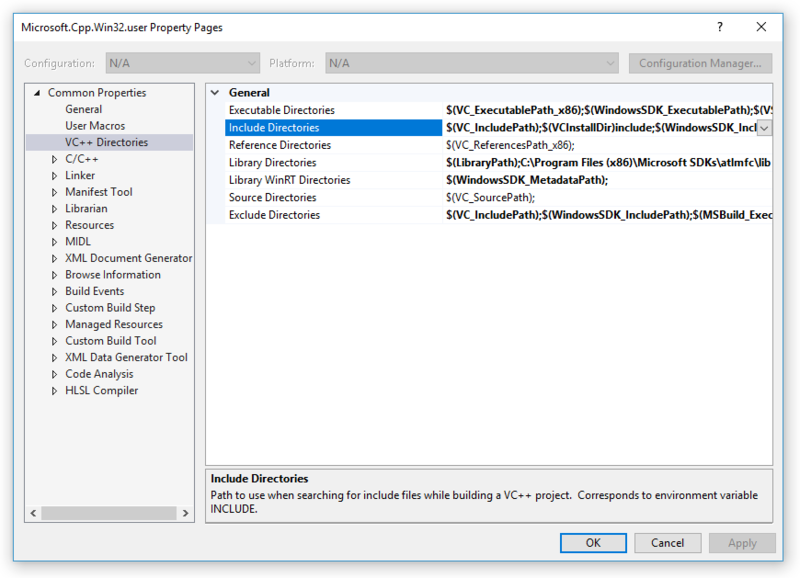 You need to install Visual C++ ATL and MFC for x86 and x64 in Visual Studio installer's "Individual Components" list. Or edit the resource filr foo_sample.rc to not require the extra header. You can check out VGMStream on Github, it also includes files which automate the full building process, which are there mainly for the buildbot. The projects there all include the WTL include path directly from each relevant project, as do all of my other more recently updated components. I no longer resort to using global paths. Some people may love these build scripts' impact on servers, as they download fresh copies of entirely everything, including the foobar2000 SDK, every time a commit is pushed to the repository. All automatically. Sure I did, but I switched to the release build right after, and didn't have a chance to test the debug build with the new include directory added, which I did now and can confirm it also works, so you both nailed it. Thanks! I tried both your edited foo_sample.rc file with the basic C++ desktop development features, and the original foo_sample.rc file after installing the MFC Visual C++ (ATL Visual C++ was already included in the desktop development package). Both ways work, and eventually I managed to see the foo_sample component and component page in the preferences. At last I have something concrete to exercise on while learning C++! I've got just one more slightly off topic question: I installed the component by manually dragging the dll on the component page, but how do you turn it into a fb2k-component file? Is it just a different filename extension or is it a proper file format? The fb2k-component is just renamed zip. Once your component is ready compress its dll and any additional files it may require into a zip and rename the extension.